Argenesis! Cranberry and pumpkin await you - and a mystery figure, which I don't know what it is but I ordered it because I missed the last one and I'm still kicking myself. Click here to see the November 30 2017 Onell Design drop menu. 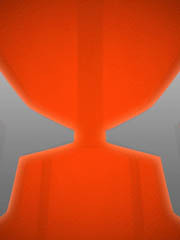 What appears to be a pumpkin-inspired Argen head teases a drop in a post called Singularity. No specifics are given beyond the date - November 30 - and time, 9:30 PM EST. I'd say "this is a good one," but you know they're all good ones. The Outer Space Men Cosmic Radiation Inferno the first time the mold has been sold as a glowing figure - that's good! What stinks is that for whatever reason, there are no new glowing red Glyos figures being made. If they jumped on it a few years earlier we'd have flaming, glowing red men from Mercury, but it was not meant to be. At least we got a glowing green one in a surprisingly vast collection of figures.